Maintaining your equipment is critical to your vibratory feeder system's long term performance. Read below for field tuning instructions for your vibratory base drives. And please contact us with any questions you may have regarding your vibratory feeder maintenance. If the bowl slows down or stops the bowl is UNDER sprung and a spring or springs need to be added. If the bowl speeds up and continues to run fast the bowl the bowl is OVER sprung and a spring or springs need to be removed. If the bowl speeds up for a short time (2 to 3 seconds) and slows back down and continues to run at close to normal speed the bowl is tuned correctly. After adding or removing springs repeat step 4 and verify results. If bowl is still not tuned correctly repeat sequence. When adding springs to base drive, evenly distribute the springs on the spring banks. 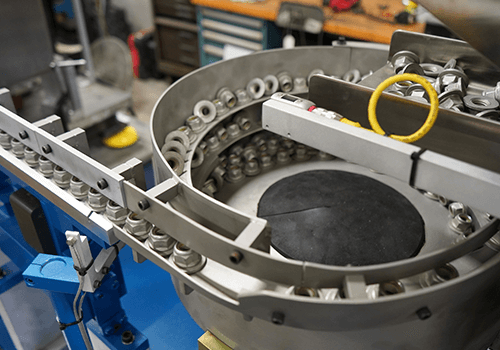 When adding a spring or springs to the base drive and the count on each spring bank is equal, add the additional spring to the spring bank that is with the electromagnetic coil. When adding springs install the thickest spring on each spring bank first (closest to the cross arm) and the thinner springs will go on last.